We are so excited to be the first stop on our Spring Canvas Blog Tour! After helping all the other participants get their fabrics, I got to thinking why not join in on all of the fun! The weather here in the Pacific Northwest has been teasing us with Spring for weeks- one minute you think it’s here and the next it’s five more days of pouring rain. All of this has made me so ready to start sewing for Spring and change up the wardrobe. One of our favorite trends for this Spring/Summer is STRIPES. They are everywhere and for good reason! They come in so many color combinations, fabrics types and variations how can you not love them? 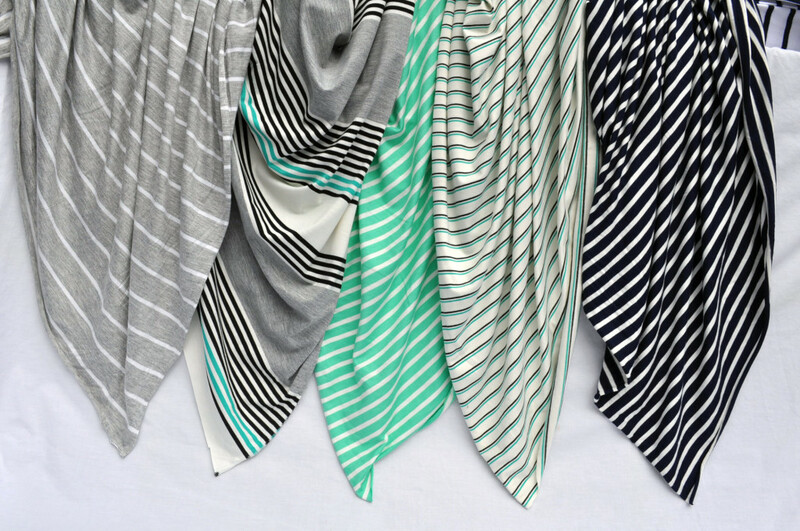 Perfect for blouses, T-shirts, dresses, skirts and lots more, we can’t wait to incorporate more stripes into our wardrobe this season. Best of all, they will never go out of style and you can wear them just about any way you want. 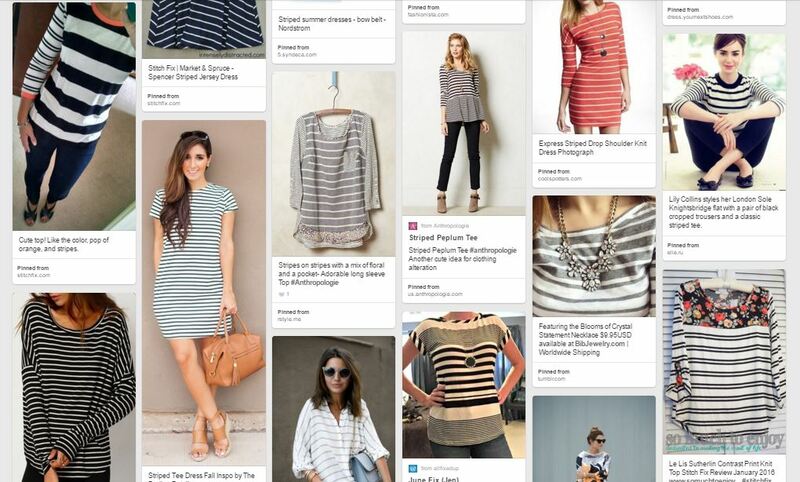 I started my stripe planning with the internet and Pinterest– our favorite way to start exploring new fashion trends and colors. During our fabric shopping we found so many amazing stripe jerseys, I knew I wanted to sew something up in some of these great knits. I have also been on a wardrobe basics kick so I narrowed my focus further to knit tops. After getting my creative juices flowing I decided to look at my pattern catalog and see what fit with my ideas. 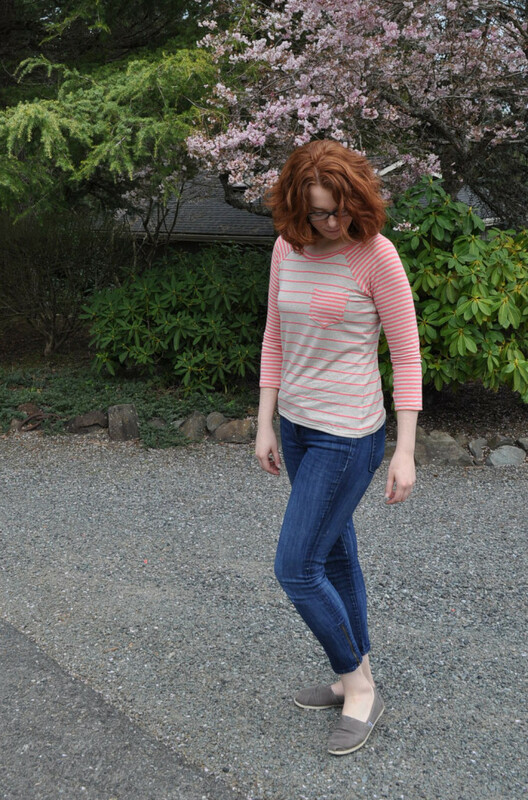 Two pattern immediately jumped out at me- Grainline Studio’s Lark Tee and Hey June’s Lane Raglan. Both have been on my list for a while now and they are perfect for really showing off some stripes. 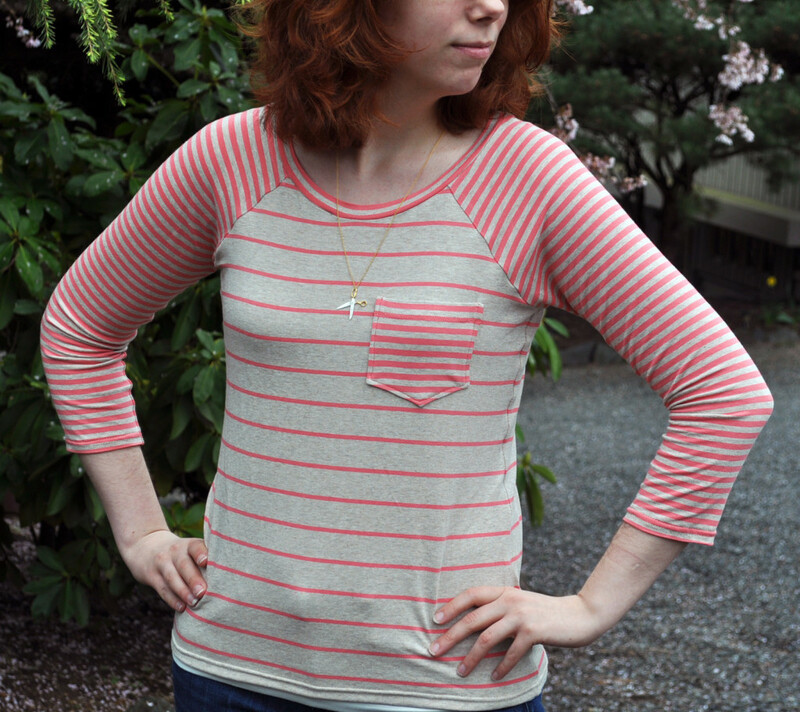 For my Grainline Studio’s Lark Tee I settled on a boat-neck with 3/4 length sleeves. I love that this pattern has so many different variations letting you mix and match a number of necklines and sleeve lengths. To top it off, Jen has posted even more variations and hacks on the Graniline blog. So cool! For the fabric I picked one of my favorite stripes in the shop, a 13″ repeating stripe rayon jersey. With a little engineering I was able to get all the stripes to match up with the beautiful wide grey stripe at the collar bone. For the sleeves it took a couple attempts, as I wasn’t sure where the pattern should be placed for perfect matching. Luckily I had enough fabric to cut a test sleeves, make a few adjustments and cut 2 more sleeves! The only other adjustment I made was to the length- before hemming I trimmed off about 1″ so that the top would hit just at my hips. I love how the boat-style neckline really shows off my aqua necklace. I am a huge fan of pairing bold statement jewelry with more casual clothes to give them a bit more flare. Totally my style! Next up, my Lane Raglan tee from Hey June Handmade! I love color blocked raglans so I thought I’d use the same approach with stripes. I could have made things easy and mixed a solid jersey with a fun stripe but why not take it a step farther and go with TWO stripes! When I saw these two coral/oatmeal knits (1 / 2) I knew they were the perfect choice. I decided on using the wider stripe for the body and the narrower for the sleeves- I auditioned them both ways but liked this combination the best. Plus the cute little pocket looks better in the narrow stripe! Again, I settled on 3/4 length sleeves- perfect for cool spring weather. Both of my stripe tees turned out amazing and I can’t wait to work them into my Spring wardrobe! There will surely be more versions of both of these pattern in the works soon. I am anxious to try some other fabric types, neckline and sleeve combinations and other styles. I’ll leave you with just a couple tips that I learned/used when sewing up these tops. 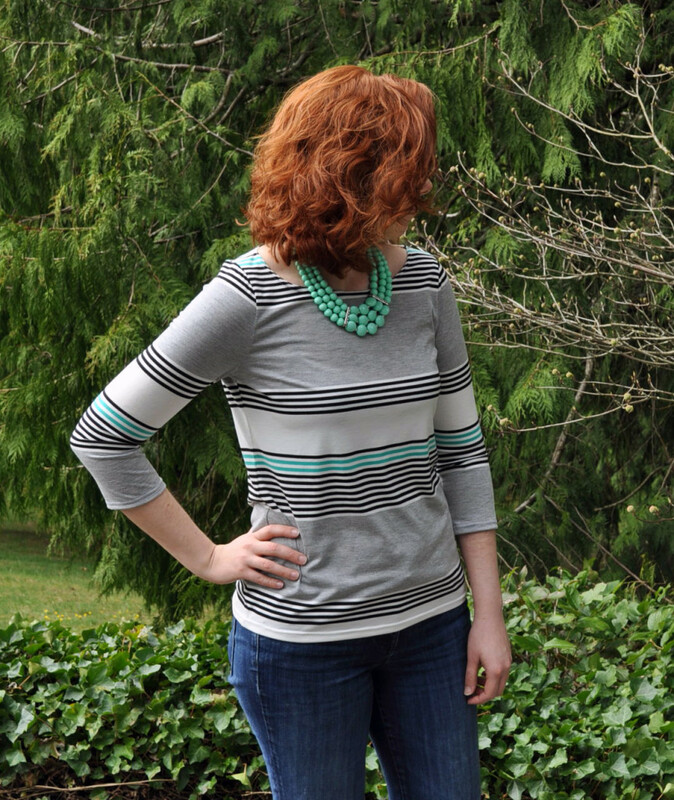 First, I typically sew all my knits with just my serger, but for both of these tops I wanted to make sure all of my stripes matched as best I could. I find that with my serger I am more likely to have some slipping- no good for stripes. To address this issue for the Lane Raglan I sewed all my seams with the zig-zag stitch on my regular machine and then finished the edges with the serger. That way I could pin all the stripe and make sure they all matched. For the Lark Tee I took a slightly different approach and basted all my seams with a long straight stitch. This secured everything in place and let me then go and serge all the seams as normal. Both methods worked beautifully and took about the same amount of time. I recommend trying them both and see which you like best. My only other tip is pin, pin, pin! Be sure to check out Day Two of our Spring Canvas Blog Tour tomorrow over on Christine Haynes’ blog, City Stitching! We can’t wait to see her finished projects! P.S. Special thanks to my dad for arranging photos with the ’46 Ford for the homepage and blog. The color was just too good I couldn’t resist! And he’s also not a bad photographer! I need to make that raglan sleeve top. You could superimpose my head over yours and no-one would bat an eye…love the style…and the Toms! The stripes are awesome! These are great tops. 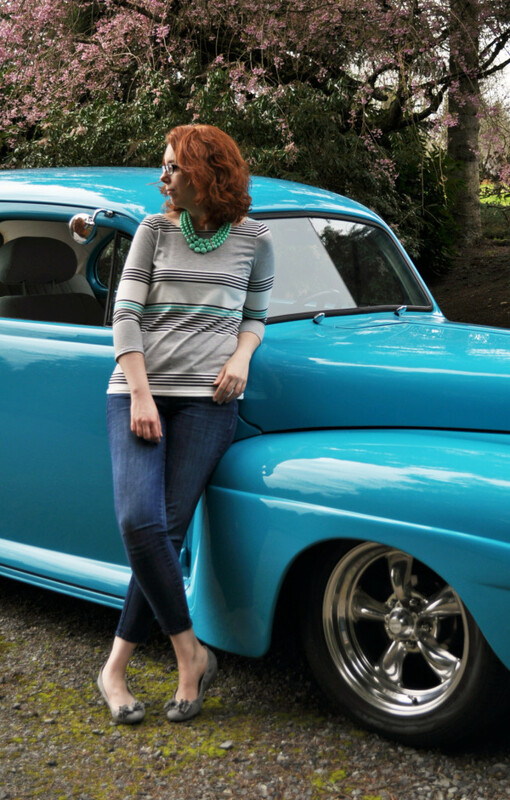 Oh the first stripe Tee is PERFECT….and who and where did that truck come from? Great shots and perfect pattern to fabric combo!